As a local skier, you know that Mother Nature’s fickle overnight ways can sometimes bless one mountain with more snow than the one a few valleys away. And when the morning sun is slightly canted more favorably toward this run or that one, you may know exactly where to go for a fresh, pleasant serving of fresh pow. Such is the wonderful dilemma created by this abundant pantry of choices we have when it comes to skiing the Lake Tahoe basin. Where do we start? Let’s begin in the backyard, with Northstar California Resort™. Quite simply, ski access doesn’t get any easier. There are several homes where you can glide right up to the back deck, unbuckle, and make a beeline for the hot tub. 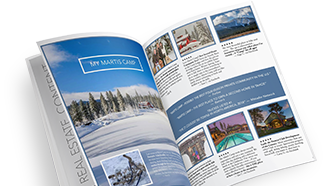 For others, Martis Camp’s private ski lodge and direct access to the mountain is a five-minute drive (at the most) and makes the day-in, day-out ski experience all too easy and enjoyable. As for Northstar California, 3,170 acres of skiable terrain radiate up and away from a village that feels it’s been directly imported from Innsbruck. This resort’s grooming team is legendary and the combination of 20 lifts, dozens of runs and a village with an ice rink, quaint cafes, fine dining and a shopping scene nothing short of “expert,” are what continually ranks Northstar as one of the top resorts in the West by Ski Magazine. Further afield, yet still about one cup of coffee away, is Sugar Bowl. On Opening Day 1939, the wheels kicked in gear and California’s first chairlift was in operation. While Sugar Bowl has kept up with the times in terrain management and all things skiing, there’s still a distinct Bavarian feel to the mountain that an Austrian, backed by Walt Disney, envisioned as the ideal resort. There’s another thing about this mountain that’s very distinct: it consistently tallies the greatest accumulations of snow, about 500 inches a year. Sugar Bowl is made up of four mountains and is home to 1,650 skiable acres with 103 trails, 13 lifts, a terrain park and a sun-splashed deck that compels you to grab a quick bite or a fine meal and an afternoon lounge session with front row views of the bowl. Still in the Donner Summit neighborhood of resorts is Boreal Mountain Resort. This mountain is likely the most easily accessed from Sacramento and the Bay Area as it faces I-80 and Castle Peak. It’s also traditionally one of the earliest to get the game of skiing and boarding underway. Halloween openings are never out of the question. There’s a renowned terrain park, Woodward Tahoe — a sport training facility with indoor trampolines, foam pits and ramps — and night skiing that runs until 9 pm. Along that stretch of Sierra backbone that runs between Truckee and Tahoe City is Squaw Valley/Alpine Meadows. For skiers and boarders, the decision for these two mountains to join as one a few years ago was cause for celebration. Their terrain includes some of the west’s greatest names, including the legendary Headwall and KT-22. Squaw Valley hosted the 1960 Olympics and the ski vibe has only become more vivid. It’s a pulse you can feel on the mountain as well as in its shop-lined village. The mountain itself has over 170 trails, 3,600 skiable acres, four terrain parks and one leg-burning run that stretches 3.2 miles. More demure (though no less impressive) than Squaw Valley is Alpine Meadows. Alpine’s skiing is spread out over seven bowls and 2,400 acres. There are more than 100 trails and 13 lifts. In the battle for which resort is blessed with the most amazing views of Lake Tahoe, Homewood Mountain Resort often finds itself wearing the crown. Located six miles south of Tahoe City on Highway 89, Homewood literally rises straight up from near lake level, landing at a perch whose views of the lake will put any poet to the test. There are four chairs that lead you to 64 runs including Homewood’s longest run Rainbow Ridge, a two mile green trail that features spectacular views of the lake. Being so close to the lake, Homewood’s annual snowfall is impressive, averaging 450 inches. Just as attractive are the quaint dining options that exist on the mountain as well as lakeside, right across the street from the resort you can grab a bite on the water at the West Shore Café. There’s another mountain that’s quick to challenge Homewood’s claim of having the best views of Lake Tahoe: Diamond Peak. This year, the mountain celebrates its 50th anniversary with a season full of events and promotions. There are six lifts, dozens of runs, one terrain park and a constant sense that you’re being drawn toward the lake as many of the runs offer non-stop views from top to bottom. Diamond Peak was the first Tahoe resort to install snowmaking in the 1960s and continues to be at the edge of the latest evolutions in creating ski conditions that are as attractive as the lake itself. Even the drive to Diamond Peak makes for a great escape. From Martis Camp, drive To Kings Beach on 267, then left on Highway 28 to Incline Village, where you’ll turn left on Country Club Drive, then right on Ski Way. On the other side of the lake with its own claim to Tahoe’s most jaw-dropping scenery is Heavenly Lake Tahoe. This aptly named mountain straddles Nevada and California with 4,800 acres of moguls, steeps, terrain parks and long, groomed stretches of sheer bliss. There are 28 lifts (including a gondola that rises from the Heavenly Village), 97 trails, a 3,500 vertical foot descent, two terrain parks, countless pubs and cafes on the slopes and at the lodges, and — as a Martis Camper you’ll like this — a direct connection to the same Vail Resorts season pass that Northstar belongs to. Translation: that pass you bought for Northstar is also good at Heavenly Lake Tahoe (among many other resorts), a nice perk that makes this candy jar of alpine happiness even tastier. There are a lot of factors that come into play when choosing where to ski:, including snow conditions, ease of access or the fact that curiosity calls out to you to explore new horizons. Either way, you’ve got a lot of great choices. And when the day’s over, you’ve got a great après scene at Martis Camp itself, whether it’s treating yourself to a spa session and dinner at the Camp Lodge or settling into a hot chocolate and a pair of slippers by the fireplace. It’s a pleasant skinundrum to be confronted with. Enjoy. I love Tahoe. Some of the best skiing on the planet. Squaw and Heavenly are up there with the best. Lake Tahoe offers everything! I love that it is also a skiing spot. Thanks for sharing this.